I really took some shortcuts with this LO. During one of my earlier visits to Sweet Shoppe Designs Gallery for inspiration I noticed a LO and added it to my favorites for a future "lift". To my great surprise, the LO was chosen to the the cookie (template) of the week, which made it even easier to lift. It's almost an exact duplicate of the original because I already had the same kit that Kay Miller used in the original LO. So no originality here on my part - just knocking out another LO using one of my favorite pictures. I think its the outfit in the picture as much as anything - I loved those brown cords and that jean jacket, and they still love to wear Daddy's ball caps. I did want to share a little tip I use for naming files. I start each file with the year the picture was taken followed by the month then a title. 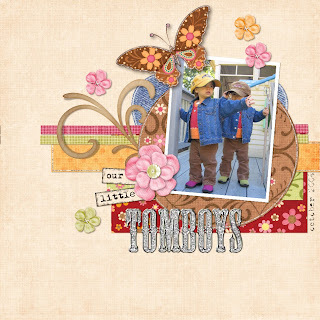 So this one is filed as "2006 10 Our Little Tomboys" In this way all the files are orderly and I can use the files to quickly organize a book since they are already in chronological order. Totally adorable! I love this LO and the twins photo make it just pop. How cute are those little suede shoes? lol I want a pair of each color! so cute, sarah!! you've done another great job! and it doesn't hurt that iva and alena are so darn adorable! !